While some consider venison chops to be a bit too gamey, many people enjoy the rich, bold taste of venison, especially when properly prepared. 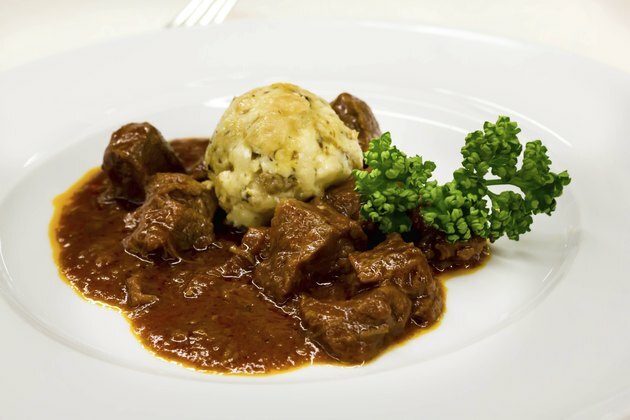 Venison can become somewhat tough and chewy when overcooked or cooked at too low a temperature, and higher heat methods are preferred by most chefs to help retain the meat's natural moisture. Pair venison chops with a glass of Bordeaux or Barbera to complement the natural flavors of the meat. Combine 1/8 cup of melted unsalted butter with 1 tbsp. of freshly chopped rosemary and 1 tbsp. of freshly chopped oregano. Stir the mixture to fully combine the ingredients. Place the venison chops in a baking dish large enough to leave about 1 inch of space between each chop. Brush the venison chops with the butter and herb mixture on both sides. Season the venison chops all over with kosher salt and coarse ground black pepper to taste. Bake the venison chops uncovered in the oven for 12 minutes. Check the internal temperature of the thickest chop in the center of the piece of meat with an instant read thermometer. The meat should be cooked to 140 degrees Fahrenheit. Remove the venison chops from the baking dish and place them on a warm serving platter. Allow the venison chops to rest for 10 minutes before serving them. Avoid cooking venison chops past 140 degrees Fahrenheit. The meat may become tough and lose flavor if cooked past 150 degrees, and the chops will continue to rise in temperature for five minutes after removing them from the oven. You can reduce the gamey flavor of venison by soaking the meat in milk for six to eight hours or overnight in the refrigerator. Pat the meat dry with paper towels before cooking it.